Being the queen of daytime talk pays a pretty penny. 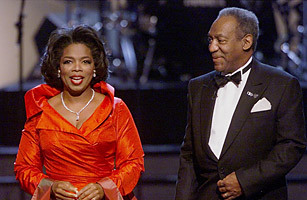 In 1995, Oprah reached a financial milestone when she supplanted Bill Cosby as the only black American on Forbes' list of the country's 400 richest people, with an estimated net worth of $340 million. Her fortune has grown since. In 2011, she clocked in at No. 124, with an estimated net worth of $2.7 billion. Forbes says she remains the only black female billionaire in history.